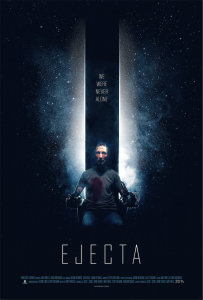 Ejecta is making its splash on the genre scene today with a trailer and poster debut, bringing with it extraterrestrial-driven horrors. Character actor Julian Richings (seen in last year's Man of Steel) leads the cast which also stars Lisa Houle and Adam Seybold in a film written by Pontypool's Tony Burgess. Matt Wiele and Chad Archibald sharing directing duties. Ejecta is the story of two men who witness an unexplainable event in the atmosphere on the eve of a historic solar storm and must survive a terrifying life form that's hunting them. An anonymous intelligence group will stop at nothing to unearth the truth behind what happened to the two men that night and prove to the world that we were never alone in the universe. The film is described as "an ode to the '80s lo-fi sci-fi era, the film’s poster, effects and electronic score pay homage to a classic time in the genre’s history while focusing on high-paced action and alien scares."